So you are finally fed up of deleting and removing photos and files that you do not want and are looking up for ways to buy more storage for your iphone. If so, you have come to the right place. It has become quite common for iPhone users to seek ways in which they can increase their storage space. Here you will find some of the ways in which you can do so and also how you can actually buy space. Media files such as your photos and videos, can be quite large in size and hence take up a lot of space on your iPhone’s memory. One manages one’s media files effectively will not only enjoy more storage space, but also a better iPhone performance. 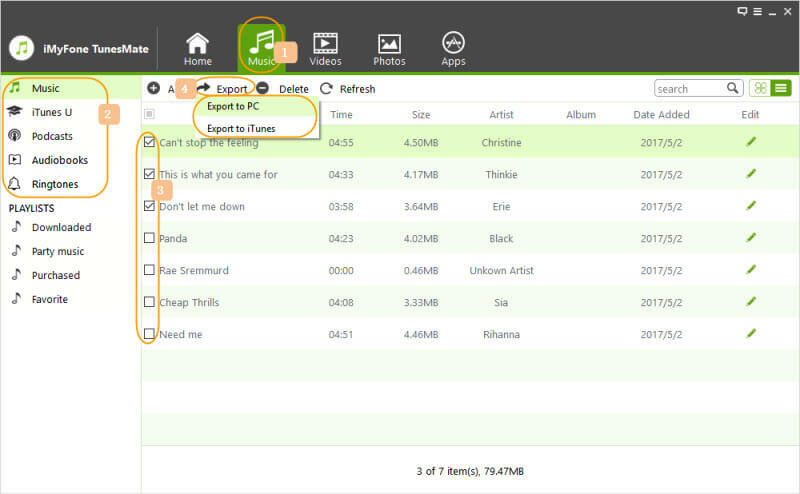 Follow the steps mentioned below to easily transfer music files from iPhone to PC. Step 1: Connect your device to the computer and launch iMyFone TunesMate. Step 2: Click on “Music” at the top, and select the music files that you want to transfer. Step 3: Click on “Export” and then select “Export to PC”. Step 4: Choose the local folder you want the files to be transported to and then click OK.
All your files will be exported to your PC and you can open the folder right away from the pop-up box that appears. Apart from buying a new SD card, deleting old files or getting a new iPhone altogether, there are other ways in which you can actually integrate more memory into your iPhone. This means you will not have to erase any more files or get those annoying ‘Memory Full’ alerts. So here are the steps that you can follow to buy more iPhone storage: increasing your memory from just 16 GB to 128 GB. Step 1: Take off your old memory flash card from your iPhone. This means you will need to literally open up your phone by unscrewing it and removing the memory. Step 2: Transfer all the data from the 32GB memory to 128GB memory. Step 3: You can then pin the new memory to your phone and restore it. Although the method sounds quite easy when written as such, in reality, it is much more complex if a common user tries to do so. Firstly, it is not easy to reopen the iPhone and install a new memory from scratch. 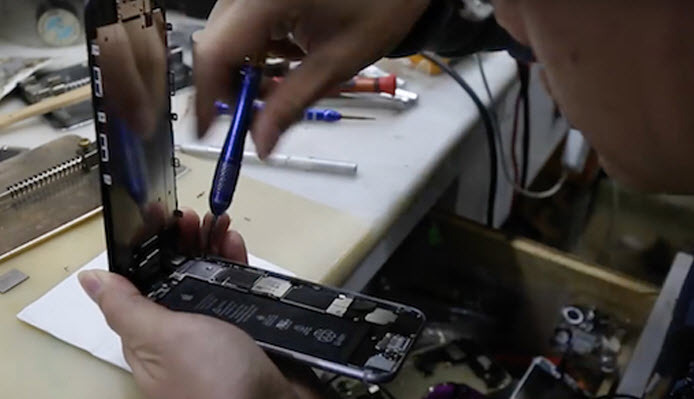 Only an experienced phone repair specialist may be able to perform the task. This leads to another problem which is the price. Although the deal may sound quite attractive, it will still be costly to get your phone upgraded. It is difficult to find someone who will do it at an affordable price. Lastly, not all versions of iPhone may be compatible with such a technique. iCloud Photo Library was designed to simplify saving photos and videos to iCloud. Moving data to iCloud is a good way to release space on your iPhone. The Photo app will begin syncing your media with iCloud when you leave it open and your device is connected to Wi-Fi. If you like taking photos and making more videos, and you don’t want to lose them, then to buying more storage for iPhone through iCloud is a more appropriate choice. Get ready to send away all your memory-eating files, particularly photos and videos, to iCloud Storage. There’s an option of increasing and upgrading the storage space by selecting a new storage plan for your iOS device. Apple only supports 5 free GB space. If you’re running out of iCloud space, you can switch to 50 GB or 200 GB storage plan conveniently, respectively priced at $0.99/$2.99 per month. However, a few things are to be consider when searching for the right Lightning drive. Primarily, it should have a battery that requires charging, companion apps for managing and streaming content from an iOS device vary in quality. If you’re not willing to pool excessive money in buying a new higher-capacity iPhone, try out the smart tips to get/buy more storage for your iPhone. Backing up your iPhone data to iCloud may be a perfect way but Apple only allows 5GB free for you. 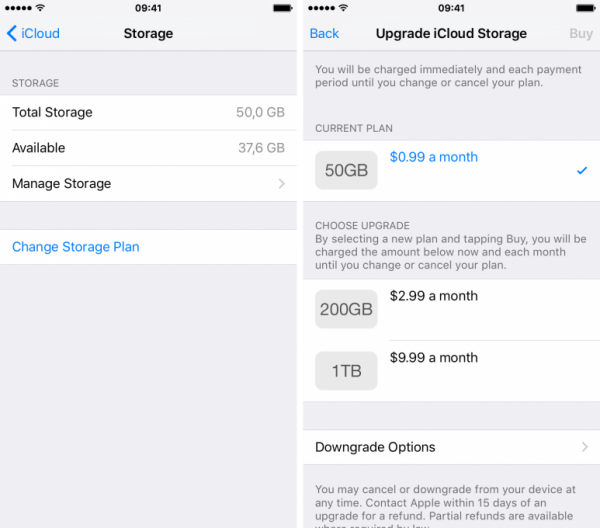 Upgrading iCloud storage is a good way but you need to pay every month. Moving the files and stuff to PC with a flash drive may not be convenient and efficient. The most important thing is you need to find the right lighting drive for your iPhone. iMyFone iPhone Cleaner may not be free, however, it will not spend you much and you do not need to pay per month like iCloud storage plan. It does you a favour in regularly cleaning your iPhone. Besides, you do not need to worry that you may delete some important files since you can preview files before deletion.